You'd expect a title released 38 and 25 weeks ago on Wii and 3DS, respectively, to have left the UK charts long ago, especially as it's not available on other platforms. Yet Mario & Sonic at the London 2012 Olympic Games has achieved just that, consistently sitting in the top ten of the all-format software chart. Thanks to the launch of the real event it seems like UK gamers can't get enough Olympics goodness, with the Nintendo-exclusive titles rising back up to a new high of third in the charts. Elsewhere, Pokémon Conquest had a modest start by entering the charts in 17th place, but UKIE does report that Pokémon is currently the 10th biggest seller of all videogame brands in the last 15 years, which isn't to be sniffed at. 3DS XL arrived on Saturday, meanwhile, but new titles Freakyforms Deluxe: Your Creations, Alive! and New Art Academy both failed to reach the all-format top 40, with the latter being the only of the two to enter the 3DS chart in 9th place. The XL did prompt a boost for Mario Kart 7 which moved up to 13th place in the all-format list, while Super Mario 3D Land also jumped up to 20th. A week of mixed news for Nintendo platforms and titles, with Mario & Sonic's athletic antics quickly becoming the sales success of the year. Super Mario 3D Land and Mario Kart 7 remain the 3DS' big hitters. They were always going to be the games that most benefited from the launch of the XL. However, I expect a few more 3DS games to creep into the charts next week. Kid Icarus, Mario Tennis and Theatrythm being the most likely candidates. I don't know what it's like in the UK, but I imagine Pokemon Conquest would be charting better in the US if they hadn't severely underestimated demand! I can't find copies in my local stores and it's tough to find online for $30 - most people have been selling it for $45-50. Fortunately Amazon looks like they're getting more in, but they have a 2-3 week waiting period at the moment. Honestly, I just played a 2 hour marathon of twelve events on Mario & Sonic Olympics with my boyfriend Saturday night. We kept track of our scores and tallied them up at the end. It was by far the best time I've had with that game yet. 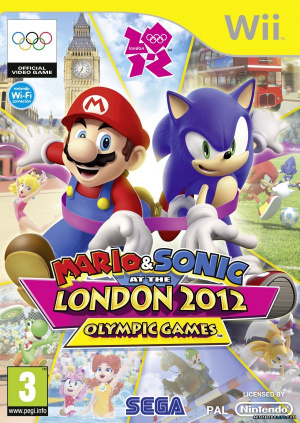 I think we both had a craving for the Olympics and Mario & Sonic definitely satiated it. No surprises as Olympic fever has hit the UK hard,just like the Womens beach Vollyball it's me hard. I vote Mario Tennis Open and Mario And Sonic 2012 3DS To be on top. Also worth mentioning that Kingdom Hearts is still in the top ten! !